Tours usually begin at the ARAM mix site. 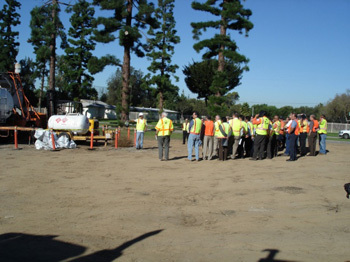 JSATs (Job Site Application Tour(s) are available on most ARAM projects in Southern California. During these tours, WPMA staff will guide visitors through the entire ARAM process. Nothing beats seeing an application first-hand. Tours usually start at the ARAM mix site, where the process of blending, mixing and reacting the ARAM binder is explained and demonstrated. Depending on the project, visitors are then taken to recently completed ARAM streets (if available) to compare them with pictures taken before the streets were repaired or reconstructed. 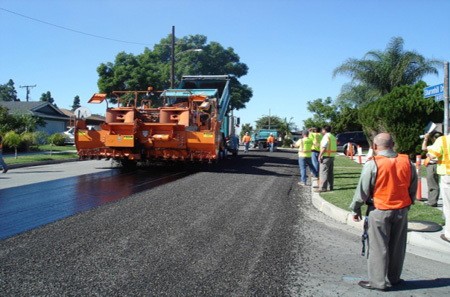 The tour concludes with, among other topics, a first-hand demonstration of ARAM applications, including the application of Asphalt-Rubber binder and aggregate, rolling and sweeping operations, and a broad overview of how traffic control is handled. If interested, please email wpma2@earthlink.net or call (213) 683-1300 so that we can schedule a tour. Please let us know what county you are in and how far you are able to travel. We look forward to scheduling your tour. Visitors can watch an ARAM application from start to finish. 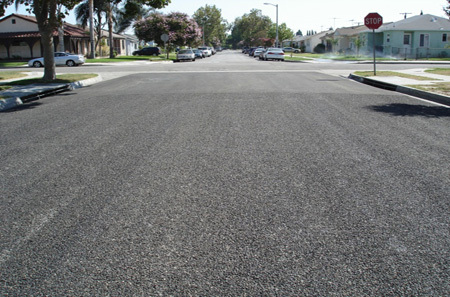 Visitors can see streets that have recently had an ARAM application applied to them.